Dr. Kate Jones shares home health best practices in Vietnam. Ph.D. student, Pam Wright, researches resistance training as treatment. Associate dean known for developing exercise programs for cancer patients honored. UofSC researchers crunch data -- lots of it -- to tackle real-world problems. The College of Nursing enhances its simulation lab by using actors. Access to quality health care may be expanded for low-income and rural patients because of a new law effective July 1. Dr. Cheryl Mele adds expertise in pediatric pain management and palliative care. Sarah Louise Faulkner combined her love of song with her goal to become a nurse. Dr. Tena McKinney is transforming mental health care delivery in SC through telehealth program. The College of Nursing recognized scholarship donors, recipients and philanthropy award winners at the Scholar Donor Recognition and Awards Presentation event on April 27. Nursing students treat patients on a medical mission trip to Nicaragua. The new CON Alumni Council held their kick-off meeting on April 3. This was the first meeting of the council, during which leaders were elected and goals for the coming term were discussed. The College of Nursing graduate program jumped 13 spots to No. 39 nationally in the 2019 U.S. News & World Report rankings. PhD student, Chigozie Nkwonta, researches educational public health interventions in Nigeria. After watching an extremely premature baby die following complications from hypothermia, Robin Dail has dedicated her career to understanding the impact of temperature on premature babies. PhD student's tool helping health care providers find quality mobile apps. 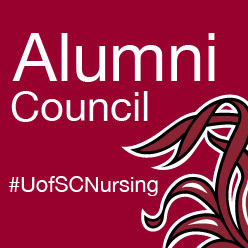 UofSCNursing alumni Ann Alexander and Terry Sims discuss why they precept nurse practitioner students and how it is vital to the growth of the profession. Kristal Tribble and Tina Williamson find friendship, support in RN to BSN online program. There are some new faces around the Williams-Brice Nursing Building this semester; three new faculty members have joined our celebrated staff. The Carolina Family Practice, operated by nursing faculty, has a new home to better serve its patients. Staying healthy is hard for patients with chronic conditions. A new center at USC is trying to help. While working as a home health nurse as she pursued her master's and doctoral degrees, Cindy Corbett saw first-hand how patients with chronic conditions struggled to manage their health. Combining resources and working together makes more sense than trying to go it alone. That's the driving belief behind the Interprofessional Education Collaborative push among the health sciences disciplines at the University of South Carolina.